Im super late posting this recipe, but whatevs. Super Bowl was awesome! Our team won, woohoo Ravens! We spent the day at a friends house eating all kinds of fattening food and betting on various parts of the game. Hubs asked me to make something “guys would like” lol So I decided on a cheesy chili beer dip! I mean, what man wouldn’t like that? 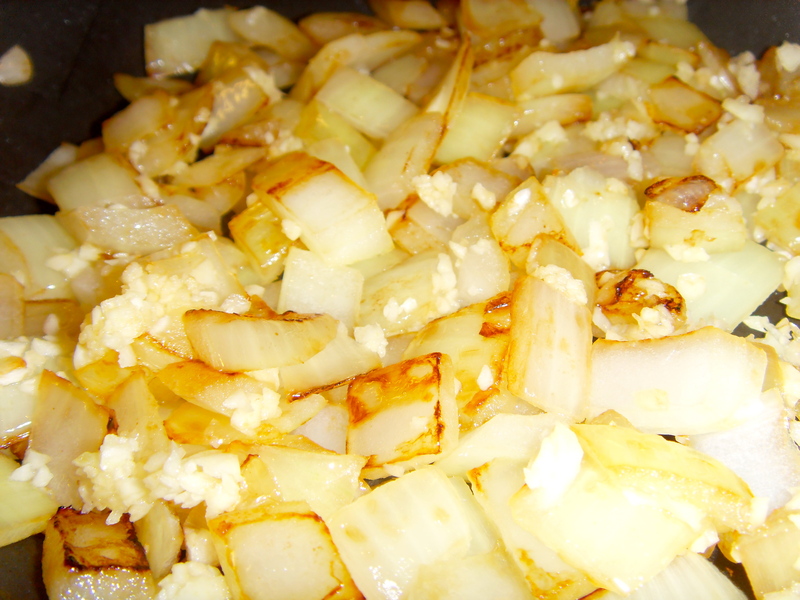 In a large skillet combine chopped onion and garlic and one tablespoon of oil. Let them sweat together for a good 3min. Add all meat and brown, about 10min. Break up the sausage and beef as you go along, remember you can use a potato masher to make this much easier. 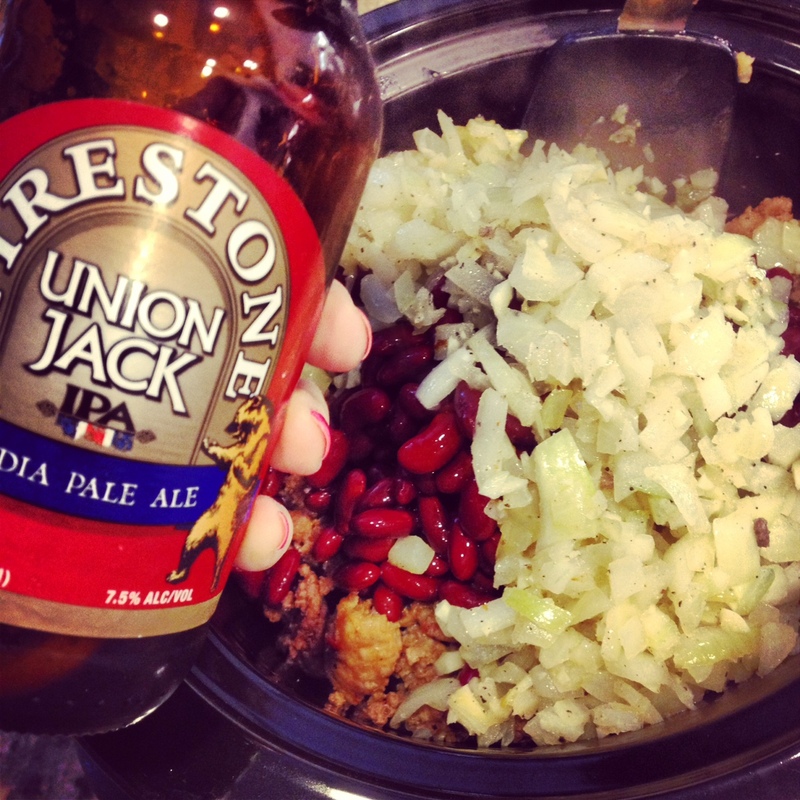 Add your bottle of beer and let it simmer until the alcohol has cooked off. While the meat is cooking, take out your crock pot and add the cheese, beans, and salsa. Set to medium and let it melt while the meat is cooking. When the meat is done, add to crock pot and mix well. When everything is melted and fully combined, you’re ready! I unplugged the crockpot and brought it with us to the party. Growing up I was pretty weird… I didn’t like most foods, I had a horrific boy short hair cut, I dressed like a weirdo – I mean I was weird. I didnt like mashed potatoes! What child doesnt like mashers? My dad always made Shepherd’s Pie, and I loved it – without the potatoes. Over the years, my tastes have definitely changed and I like a lot of things I never knew I would. Its been pretty chilly lately here in Southern California, so what better to make than something hearty and hot? Mmm, Shepherd’s Pie! Buttery potatoes, ground lamb, and veggies all in a thick gravy. Yum! Peel, rinse, and cut into quarters. 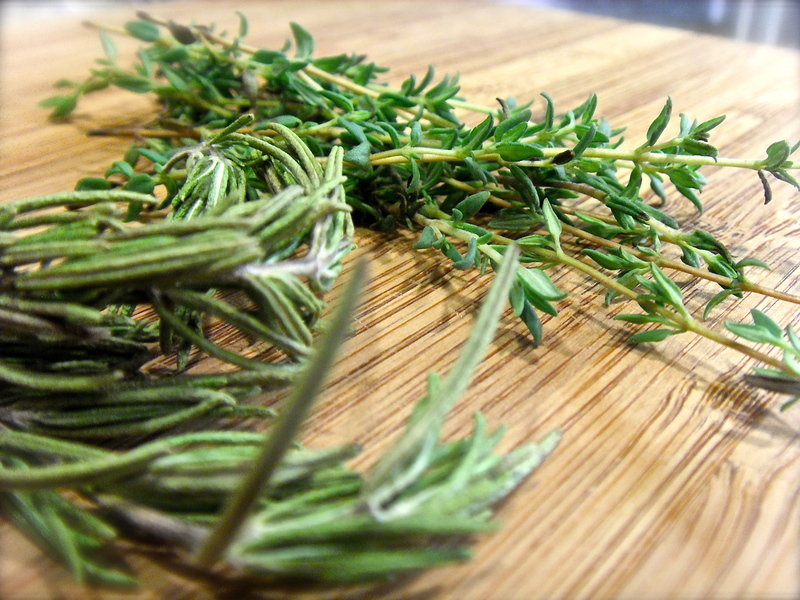 Place in a pot with cold water, bring to a heavy boil until tender – round 15min. When they’re done, drain, and add back to pot. Mash the potatoes a little, and then add liquid, yolk, and seasoning. Set potatoes aside. Heat your oil in a deep skillet and add your lamb, adding salt and pepper to the meat as you break it up. 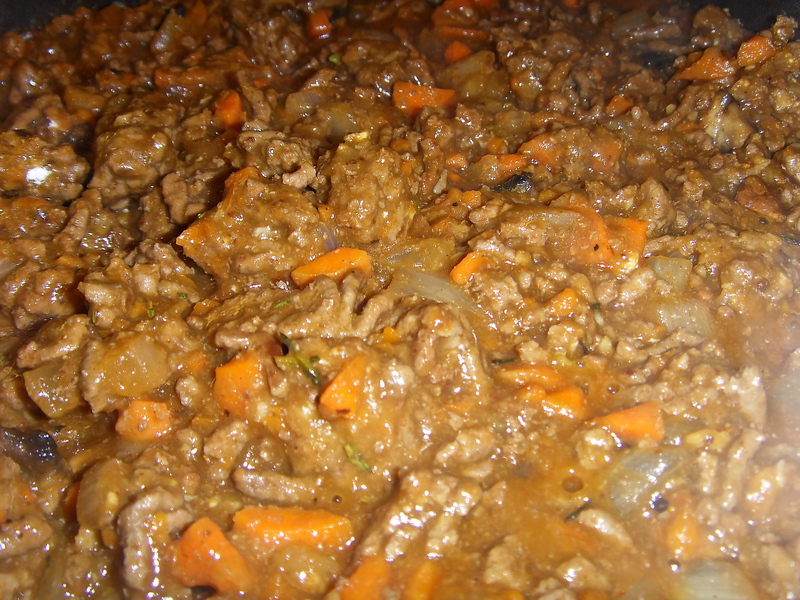 Let the meat brown, not scraping the pan too much, and set meat aside when fully cooked. 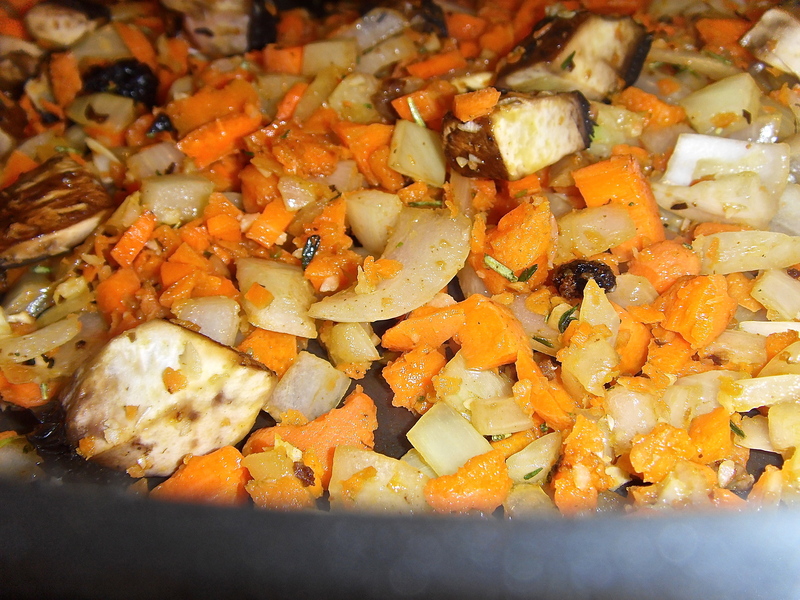 Add your carrots, onion, mushrooms, and fresh herbs to the same pan and let them sweat. As they get a little softer, scrape the seasoning off the bottom so they’re able to soak it all up. Put the lamb back in the pan and mix well, also adding the Worcestershire. Sprinkle with flour and toss to coat evenly, cooking about another minute. Stir in tomato paste and chicken broth and bring to a boil for 1 minute. Reduce heat to low, cover and simmer for about 12min letting the liquids thicken, stir occasionally. 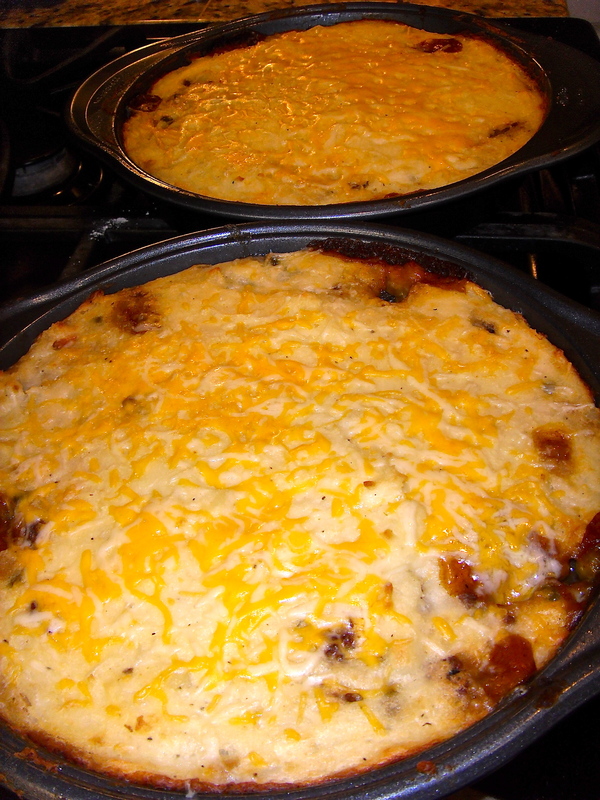 Add the corn and peas to your pan and mix well, then spread the mixture evenly in a medium baking dish. Personally, I used two round pie pans, because I didn’t want to take up too much space in my refrigerator with a big pan of leftovers. You can use whatever size or shape pan you want since all of the ingredients are fully cooked before you bake it. After the pan is filled, spoon the mashers on top with a plastic spatula. Start at the edges of the pan, making somewhat of a seal so the gravy doesn’t boil over while you’re baking it. Cover completely with potatoes, add dish to a cookie sheet, and put in a 400° oven for 20min and then take them out and let them rest for 10min. I decided, last minute, to top the pies off with a little cheese. 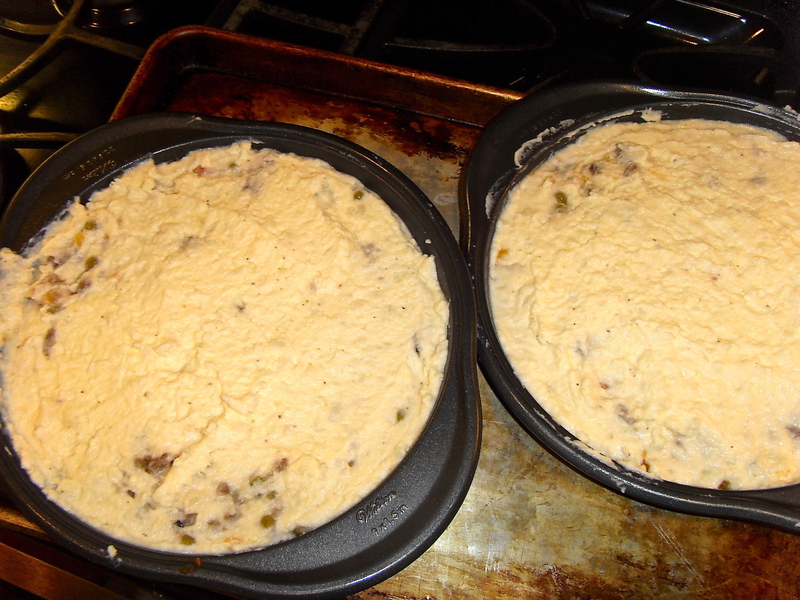 So, instead of taking the pies out after 30min, I turned the oven off and left them in there so the cheese could melt. Such an easy and delicious dish. I really enjoyed making this, nothing stressful or overwhelming about it at all. I would really suggest this to anyone with kids that needs to add a little more veggies to their lives. You can make it with any ground meat, I suppose. Where have I been?! I just recently fell in love with Broccoli Cheese soup, I know – right? I am a little picky about it, and really only like the kind from Panera. 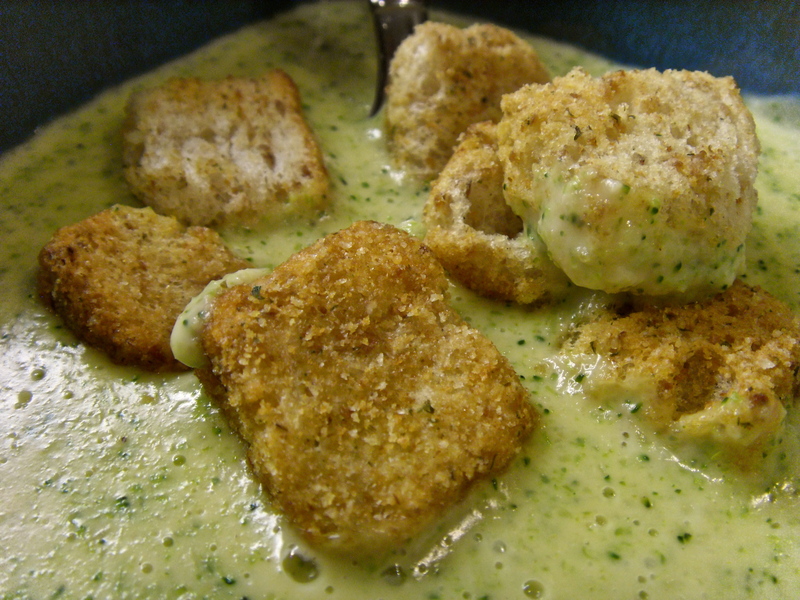 But, I have had an emulsion blender for ages now and have yet to make any soups, so that is my goal this winter! Soup! Tonight I decided to try my hand at one that seemed rather easy.. I looked at a bunch of different recipes, and decided to just combine them and make my own. Nothing really stood out to me, and the supposed Panera recipe sounded just weird, plus it didn’t call for a blender and I wanted to blend, dammit! Maybe next time..
To make things a little easier, I microwaved my broccoli. Don’t trip, it makes perfect broccoli actually, and you’re going to be blending it all up anyway. No need to lie and say I steamed and blanched it, because I didn’t. Cut the hard stems off, add to a microwavable bowl and add about 1/4 cup of water. Cover and microwave for 4min on high then set to the side. 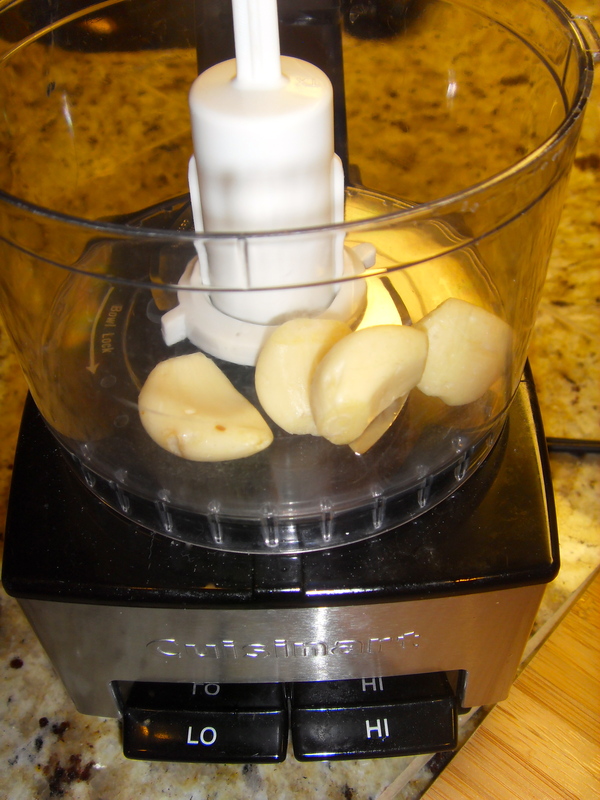 To make things even easier, I decided to use my trusty Miniature Cuisinart for the garlic. It really is an amazing little thing to have around, especially for someone who doesn’t need a huge food processor. I probably could have left the cloves whole, since I was blending it all up anyway but I wanted to chop it up. I started the onion and garlic on low heat with a little EVOO and let it do its thing. Dont be afraid to let your food cook without always messing with it, just make sure the heat is right so it wont burn. In a soup pot I melted the butter and gradually added the flour, stirring the whole time, about 2min. As the butter was melting on medium heat, I microwaved the milk for 2min and then poured it into the butter flour mixture, whisking constantly, until it thickened – about 5 to 8min. Warm your chicken broth in the microwave and then it to the pot also, still whisking. 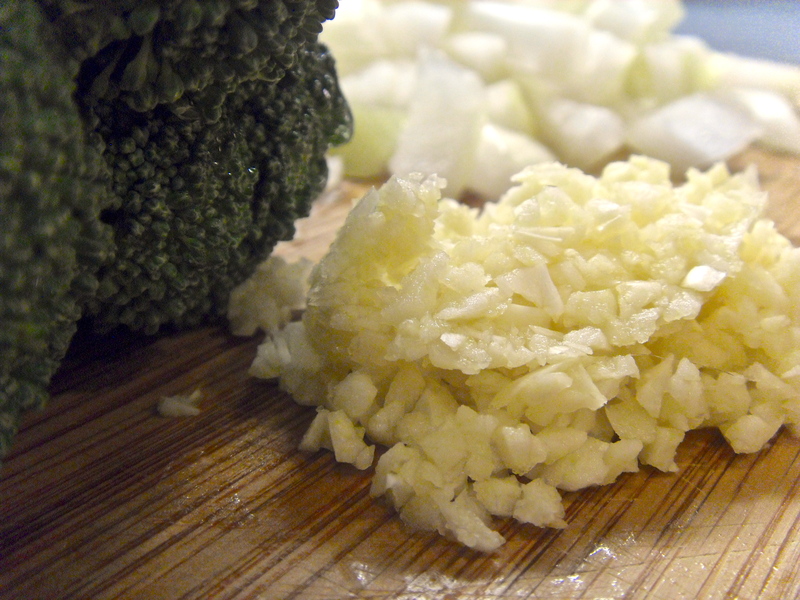 By now, your garlic and onions will be nicely browned and aromatic and you can add that to your pot as well. Then comes the deliciousness, cheeeeessseeee! 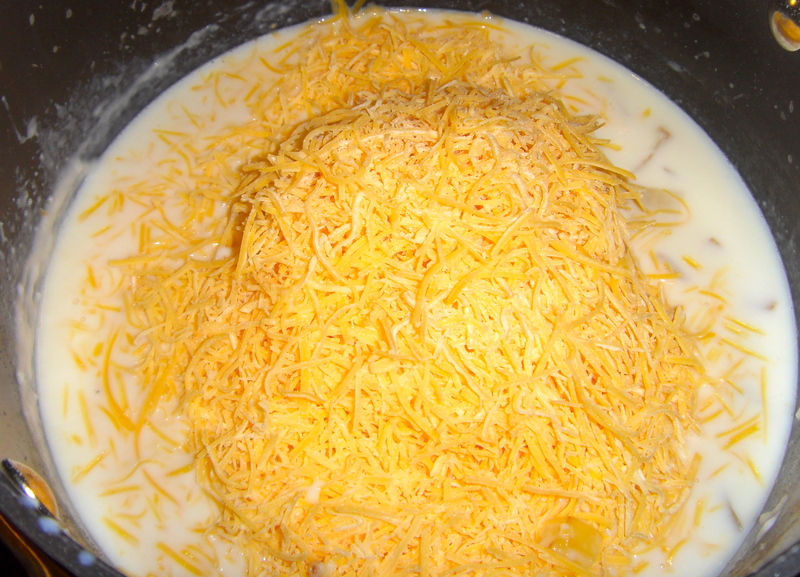 Turn the pot to low, and add all of the cheese at once. 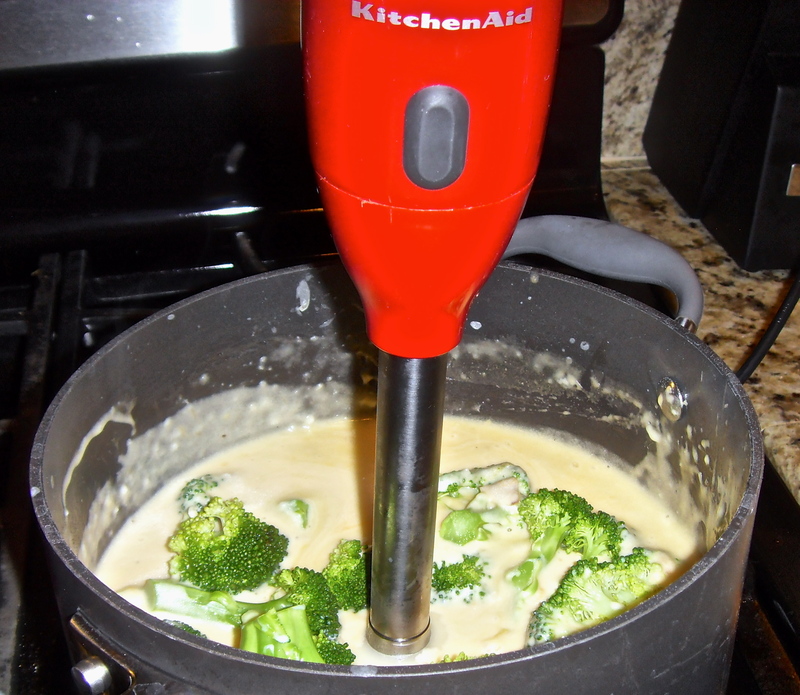 I used a whisk, but you can use whatever you want, to mix it all together until the cheese is completely melted and mixed in.. Before you add the broccoli, take a small spoon and taste your soup. You may want to add a little more salt or pepper, or whatever you want. Then add broccoli, and blend until the soup is to the consistency of your liking! I must share a secret with you before I sign off.. I am lactose intolerant. :O I know, and I decided to make mac n cheese, and cheese soup? I will share my wonder pill with you, only if you promise to USE it! It works, and you can really eat things with lactose! I carry some in my purse with me everywhere I go. Make sure you get the pills, chewable or swallow ones. I take two if Im going to be eating a ton of lactose and I’ve never had an issue. Some people don’t like the pills, and just don’t eat lactose at all… but I couldn’t live without cheese, ice cream, and yogurt. Sowwie body.